Every so often, you meet a person who radiates joy. Who seems to know exactly why they were put on this earth, and glows with a kind of inner light. Life, for these people, has often followed a two-mountain shape. They get out of school, they start a career, and they begin climbing the mountain they thought they were meant to climb. Their goals on this first mountain are the ones our culture endorses: to be a success, to make your mark, to experience personal happiness. But when they get to the top of that mountain, something happens. They look around and find the view… unsatisfying. They realize: This wasn’t my mountain after all. There’s another, bigger mountain out there that is actually my mountain. 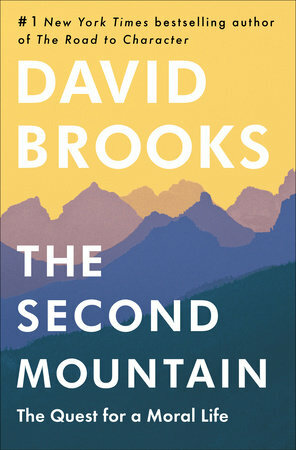 In The Second Mountain, David Brooks explores the four commitments that define a life of meaning and purpose: to a spouse and family, to a vocation, to a philosophy or faith, and to a community. Our personal fulfillment depends on how well we choose and execute these commitments. Brooks looks at a range of people who have lived joyous, committed lives, and who have embraced the necessity of dependence. He gathers their wisdom on how to choose a partner, how to pick a vocation, how to live out a philosophy, and how we can begin to integrate our commitments into one overriding purpose. In short, this book is meant to help us all lead more meaningful lives. But it’s also a provocative social commentary. We live in a society, Brooks argues, that celebrates freedom, that tells us to be true to ourselves, at the expense of surrendering to a cause, rooting ourselves in a neighborhood, and binding ourselves to others by social solidarity and love. We have taken individualism to the extreme—and, in the process, we have torn the social fabric in a thousand different ways. The path to repair is through making deeper commitments. Brooks shows what can happen when we put commitment-making at the center of our lives.